Blog | KalamazooBiker.com | West Michigan's #1 source for bikers! First off let me say THANKS for all the help that I received from visitors in 2012. I started this website last March (2012) when a friend bought a new Harley. Immediately after getting the bike he started asking questions; where’s that bike night in Paw Paw, what’s the name of that place that makes stretched bags, where did you get your chaps. I decided that I’d write him an e-mail telling him all the things a biker needs to know in Kalamazoo/West Michigan. I realized that if he has questions so must other people. And with that the site was born. I figured we’d get a few hits but in 2012 we had over 15,000 hits and average over 500 unique visitors every month. We had nearly 900 unique vistors in August and in July. My hope this year is that we continue to add rides and events and with the new websites readers can comment on every page. If you’ve gone to a bike night, rally, ride or show, or have used one of our community’s business please leave a comment with what your experience was so that others may learn from it. Thanks, here’s to the 2013 riding season it came come soon enough!! I had a great response from everyone last year on this site and since it isn’t riding weather I decided to updated the site for 2013. So check back in a few days or weeks and let me know what you think. And please, give me your feedback!! Let me know what needs to be added either in functionality to the site, info about events in 2013 or anything else! I’m going to make this website more interactive so people can have a forum to discuss the events along with learn about them. 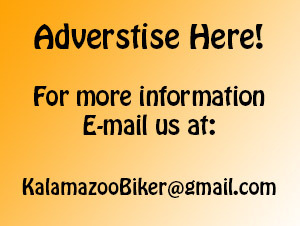 Send all feedback to Kalamazoobiker@gmail.com or leave a comment! What am I missing? What else out there would be a good addition to the site?